When people find out I am a Disney guy the first question I generally get is how much does it cost to go. The second question is how can I get a discount. And as many of you know, a Disney trip is often not one where financial corners are easy to cut. 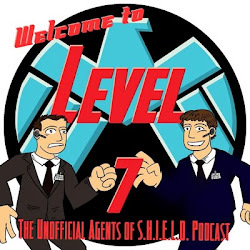 But podcaster and author Lou Mongello has stepped up to the challenge of educating readers on how to make a Walt Disney World vacation a cost-effective adventure. 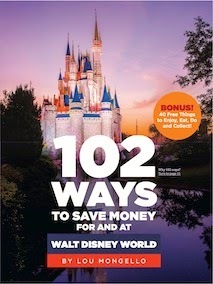 102 Ways To Save Money For and At Walt Disney World by Lou Mongello is a guide to saving and spending effectively while on vacation at Walt Disney World. The book examines the most common trip planning areas from pre-trip preperation, tickets, accommodations, packages, dining (we are talking about Lou Mongello here), shopping and more with detailed tips on saving money. The chapters are all easy to read in an outline like format for easy reference. Additionally, the format makes it easy to find specific tips one is looking for quickly. Along with the money saving tips Mongello provides, he also offers a bonus chapter that lists 40 free things that one can do, get, see, eat and collect in Walt Disney World. The pages of the text are visually pleasing, with color chapter pages with bold images and color pictures from the resort scattered throughout the book. Seasoned Walt Disney World fans are likely to find some of the book's money saving tips as "common knowledge". And I will admit that I found tips that matched some of my own touring habits, like getting free water instead of pop. However, there was plently I had not considered or known about like saving dinner on meals by being creative with side dishes. But I will argue that this book is a nice addition for the seasoned guest's library but it is an even better starting point for the new visitor's trip. Yes, I had learned some of these lessons through experience. But how much nicer would it have been to my pocket book if I had someone shared with me these lessons before my first visit! And I think it helps simplify some of the more frustrating issues such as the Dining Plan. You, Mongello and me may all have opinions of the Dining Plan but his discussion of the plan is fair and demonstrates clearly who the plan would work best for and for who it will be effective for. I like this as it will allow the reader to make up their own mind if this add on is for them. I read the electronic version of the book. And I feel that this is the version that best serves most readers. First, Mongello has a library of podcasts and videos that further illustrates and describes the issues he writes on. So in the electronic version, if a reader wants additional information on a topic they are provided with links to additional mulit-media content to explore. In a print version of the book the add-ons are effectively lost since it is not just a click away. Second, the electronic version is the most portable version. It can be read and accessed while vacationing on one's phone, without taking up valuable backpack space. And honestly the bonus chapter and topics like dining contain information one would want while touring Walt Disney World. So for just ease of use, electronic seems the best format for the money. Lou Mongello makes a bold guarantee. You will save money! And if his 102 tips do not effectively save you money he will refund the purchase price of the book. My guess is that he will not be asked to provide many readers of 102 Ways To Save Money For and At Walt Disney World their money back. Because if you be a new visitor or an experienced guest, one is likely able to find advice based on real life experience in the parks that will help save a few dollars (if not more) while enjoying Walt Disney World. And it is really nice that when folks ask me how to save money on their trip I have a title to reference them to instead of writing my own lengthy paragraphs.